Week 4 5- 15 knot gradient Noréaster shifty and patchy. Boat performed best yet. 1. Cheap and reliable Being over powered means it is about the sailor not the wallet. Basically you get a free motorbike (In comparison) and you have a boat that will get you to the finish line if you can get it there as long as do some basic maintenance! 3. Does not take away from standard fleets 90 kilo crew weight minimum and a 2 minute yardstick penalty at PBSC plus the degree of difficulty naturally restrict the concept. 4. Rigging/ Unriging with furler is easy single handed by just attaching the jib while the mast is on the deck and using the jib halyard. Note 1. I am not recommending you buy a motorbike with your savings it is for illustrative purposes only. Note 2. I am not recommending you sail in 25 knots if you cant handle it. But at least your boat can! 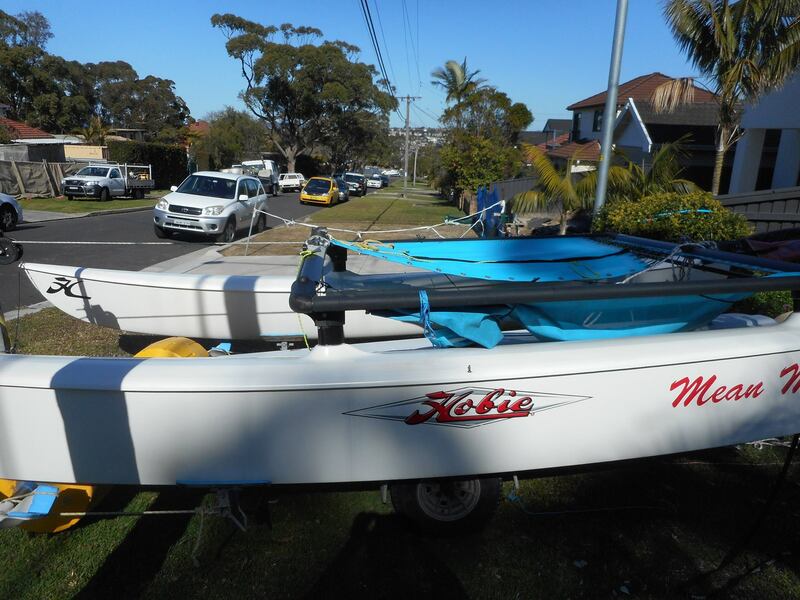 So get the bloody boat out of the garage and stop having to worry about finding a 30 kilo crew! Come down to PBSC and see if you can win a beer off me! 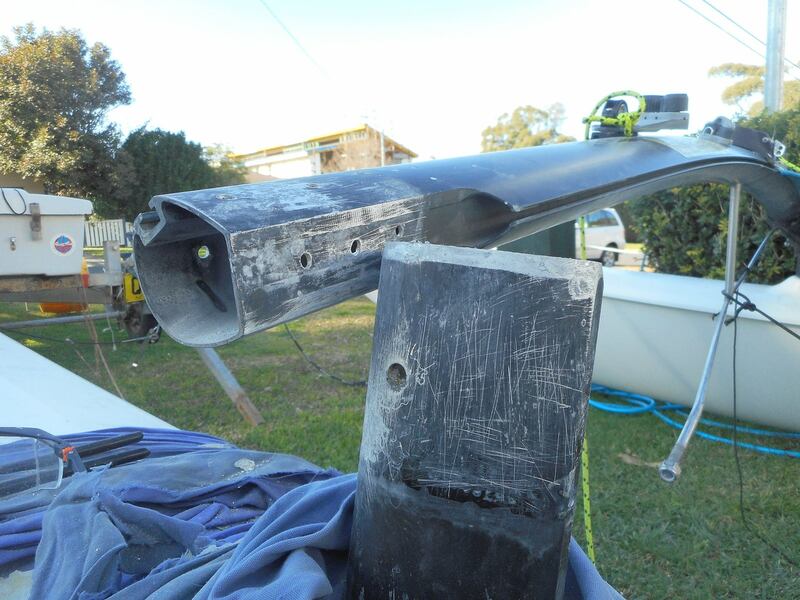 If the boat is glued you will need to cut the casting off, be careful not to damage the pylon or crossbar. Do this on the ground not on the trailer so you can shimmy and shake the boat when reassembling to avoid binding. Remove all the old glue and debris from the pylon and crossbar. Use a slow setting glue. Remember the boat is not aligned until the casting is all the way down. So you need to twist and shake the boat a bit to find the sweet spot. Use slow setting glue so you don't get stuck. Pun alert.. It will probably need some persuasion for the last inch or so. 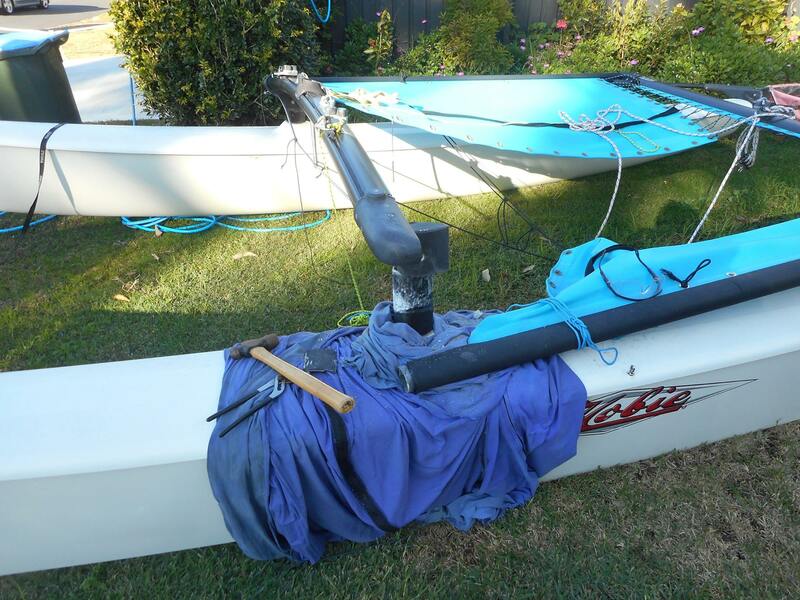 As soon as assembled return to the trailer so that glue dries with the boat on a squared up frame. Unless of course you have bent your trailer..
Let the glue set for a week and you are ready for the next lovely little 25 to 30 knotter that comes your way. There will be compulsory righting clinic before the Marathon next week. Even if you are not sailing you should attend this if you can't right your boat immediately with no fuss. Time will be posted a latter date depending on the start time for the marathon. Learn the basics of how to trapeze. On course report by Andrew Nelson: I noticed it documents all my ''deliberate" errors from the on the water session. 1st Start Strategy "Run the line" Would have worked well except it was the wrong end of the line and the wrong side of the first work. 3rd Start ""Port Tack and Gybe onto Starboard. "" Would... have worked except the red mist came down and we took on the Hobie 18 Both OCS. 4th Start Tried option 3 again. Worked well crossed line on starboard as Because we were moving were better able to manage the wind shift. Summary Wining the pin is a risky strategy. Especially on a difficult line like yesterdays with a massive tide pushing you through the line. Practice and confidence in your own strategy are paramount.